If you’re a Trillium-lover, now is the time to head for the mountains. In the Great Smoky Mountains National Park, you’ll see them carpeting the wooded slopes along Newfound Gap Road (US 441), which runs from Cherokee to Gatlinburg. They are especially abundant near Collins Creek on the North Carolina side and Chimneys on the Tennessee side. 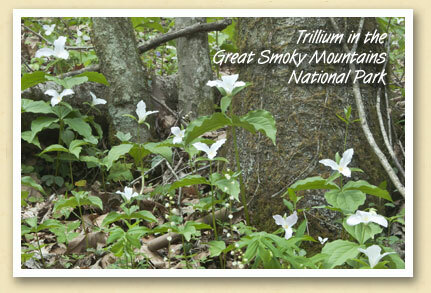 The Large Flowered White Trillium (above) is the most abundant of the Trilliums of the Great Smoky Mountains. The big, bell shaped white flower, which usually turns to a delicate pink with age, is on a stem 10 to 15 inches high. When started from seed, Trilliums take 6-8 years to have their first bloom.